Due to the high number of Holden Cruze vehicles that we see through the shop, we get to know some of the pattern failures and the most economical way for you to repair them. The Holden Cruze F18 engine has a common failure point of the seals in the oil cooler failing and allowing oil to mix into the cooling system. We keep a keen eye for any oil in the cooling system during servicing to ensure it can be repaired before any further damage occurs – or even better, we recommend replacing these oil cooler seals periodically to completely avoid the need for any other oil damaged cooling system parts. As the extent of the work required depends greatly on how much oil is in the system and how long it has been left to deteriorate any rubber components, you are best to contact us to walk through a price estimate of your specific situation. So if you are looking for a mechanic who knows your Holden Cruze front to back and can take care of the oil in coolant problem before it even arises, contact us today on 3809 2711. Whichever side of the fence you’re on, it is clear that emissions is an increasingly dirty word, and internal combustion engines have the finger squarely pointed at them by lawmakers. Near the top of the hit list is diesel (thanks VW Dieselgate). With a modern diesel engine still relatively simple in design, it is the emissions management and after treatment systems bolted onto it that can resemble something from the Mars rover. One such system, perhaps with the worst rap sheet of them all, is Exhaust Gas Recirculation (EGR), or as many forum goers will correct you, ‘The Antiperformance Valve’. A valve with such bad intentions it has entire online shops dedicated to banishing it from existence with blanking plates and voltage modifiers. Heck it’s got such a bad reputation there’s even old wives tales about it. “Want the best bang for buck, get the blanking plate with a hole drilled in it” boasted Jim to Rob down the pub one Sunday, not knowing his mate Tom actually told him to drill a hole in the intake air throttle flap. Tom knew on some models this could fool the computer into not cottoning on to the fact that air pressure and flow were not as it modelled when EGR was commanded, stopping that ‘annoying’ emissions light coming on. Banter aside, the once primitive EGR system has gone through changes, and leads the way as one of the cheapest and most effective ways of reducing Nitrogen Oxide emissions. This is good for anyone with a vested interest in diesel, because it is my belief that expensive after treatment systems will be what ultimately forces the market away from diesel. The after treatment list grows by the day, with even the lowest of base models utilising expensive items such as the Diesel Oxidisation Catalyst (DOC), NOx Storage Catalyst (NSC), Diesel Particulate Filter (DPF) and Selective Catalytic Reduction (SCR, in layman’s terms – Exhaust fluid injection). So how is our soot depositing, intake blocking, code setting enemy, EGR, improving to help keep diesel purchase reasonably priced for consumers? The regular EGR system we are all used to, is commonly referred to as High Pressure EGR (HP EGR), or sometimes referred to as Short Route EGR. This utilises exhaust gas in the exhaust manifold, before the turbine, routed into the intake manifold, after the turbo compressor. Increasingly becoming the norm, are systems referred to as Hybrid EGR. These keep the benefits of High Pressure EGR, as well as adding in a Low Pressure EGR (LP EGR) system, sometimes referred to as Long Route EGR. Low pressure EGR takes exhaust gas from further downstream of the turbine, often after a DPF, routing it into the intake stream, before the turbo compressor. Each system, HP EGR and LP EGR, has different pros and cons, hence each is operated during different load situations in a Hybrid EGR system, sometimes even with both operating at the same time. Best thought of as ‘EGR lag’. HP EGR can have a valve mounted directly on the intake manifold, so when it opens, exhaust gas reaches the cylinders quickly. LP EGR requires exhaust gas to travel the entire length of intake plumbing before its result is achieved. This long path does however improve equal cylinder distribution in the LP EGR system. As LP EGR can use exhaust gas after the DPF, it is close to being soot free. This gas does need to pass through the turbo compressor, so often for safety a filter will be incorporated in the LP EGR cooler to eliminate any possible soot particles. This is something to consider when purchasing aftermarket coolers. LP EGR allows all exhaust gas to travel through the turbine, allowing quicker turbo response than a HP EGR system which bleeds precious exhaust energy before the turbine. Conversely, in a LP EGR system we now have fresh air and exhaust gas passing through the turbo inlet compressor, meaning a larger turbo is required to handle this larger amount of gas. This larger amount of gas flow in LP EGR is particularly useful at low speed, high and low load points, where traditionally EGR rates are high but overall air flow is low. The operating point of the Variable Nozzle Turbo can be moved to an area of higher efficiency, increasing fuel economy and decreasing compressor surge while decreasing NOx and soot. In high speed, high load points, HP EGR gradually decreases the difference between exhaust and intake pressures, even lower than LP EGR, so HP EGR becomes the better option for the trade-off relationship between fuel economy, NOx and soot. Throughout the midrange and steady states, a combination of HP EGR and LP EGR can be used. With the turbo compressor wheel living most of its life well over 100,000 rpm, routing exhaust gas through it is a tricky proposition. Particular attention is paid to the EGR cooler in a LP EGR system, as any water droplets formed from condensation as the hot exhaust gas pass through the cooler could be disastrous. Often an EGR cooler bypass valve will be utilised to prevent hot exhaust gas passing through a dead cold cooler as the vehicle warms up. Exhaust gas can also accelerate corrosion on the compressor wheel, therefore a special turbo designed to resist this must be used. Variable Nozzle Turbo (VNT) – The variables nozzles of the turbo are a key aspect in manipulating exhaust backpressure throughout the load range. It is able to create higher exhaust manifold pressure than intake pressure, allowing exhaust gas to flow into the intake manifold. Intake air throttle valve – When load situations mean it is not reasonable to use just the VNT to create high exhaust pressure, this valve reduces the intake manifold opening, reducing intake manifold pressure, allowing exhaust gas to flow into the intake manifold. A secondary function of this valve is the closing on engine shut down for smoothness and to prevent an emergency diesel runaway situation. Exhaust air throttle valve – Usually located downstream of the DPF, this is the preferred method of creating exhaust backpressure in a LP EGR system to drive exhaust gas into the intake piping. EGR pump – A less fuel efficient option on a LP EGR system is using an EGR pump, downstream of the DPF, either electrically or crankshaft driven, to pump EGR gas towards the intake. Turbo compounding – Common in trucking, a separate turbine is added after the turbocharger’s turbine. This increases EGR flow by increasing exhaust backpressure. To recover some of this energy lost through pumping losses, the added turbine transmits to the crankshaft through a transmission. Reed valve (one-way valve) – As exhaust pulses come in peaks and valleys, the use of a reed valve can allow exhaust gas to flow into the intake during a peak, even though the average exhaust pressure is below intake pressure, which would otherwise to be too low to drive flow. Fast rotating valves – Mahle has developed a component named – Rotating fast-switching charge air valve (SLV-R). Similar in concept to a reed valve, this is best thought of as an electrically powered whirly bird, installed in the intake stream, creating intake air pressure peaks and valleys as it continually spins. As you can see, great effort is used to get exhaust gas back into the intake, so as ‘EGR Performance’, ‘EGR Flow’ and ‘NOx level exceeded’ codes become more and more common it is important to consider the whole system and how it works in unity rather than focusing on the actual EGR valve itself. The Engine Control Module, is often watching Mass Air Flow (MAF) and Manifold Absolute Pressure (MAP) sensor readings to set these fault codes, particularly in systems that do not utilise a position sensor on the EGR valve. Obtaining the correct manufacturer code setting parameters can be the key to faster diagnosis. I find TaT’s ‘Good scan/scope data’ section (accessed from the TaT homepage) a great resource when diagnosing EGR flow problems. I’ll often jot out a table of RPM, MAF, and EGR command to compare my problem vehicle with known good readings. This gives great direction for possible system blockages, so you can recommend physical pull apart of the system to the customer with confidence. Be forewarned though with this method to ensure all other parameters are equal when making your table. As I hope I’ve demonstrated, modern EGR command is a complex dance between engine temperature, load, HP EGR and LP EGR systems – so you want to ensure you are comparing apples with apples. It has happened to most of us – the brake light switches on and we see the dollar signs in front of our eyes! Brake repairs can be very expensive, so if your brake light switches on, you always need to have it checked by an experienced mechanic. If the brakes feel spongy when the light is lit, it’s safer to pull over and have your car towed to your mechanic, otherwise you can probably drive to yourself to your mechanic. If luck is on your side, it’s just a fault sensor switch, but if you are out of luck, it could be the first sign of a big problem. Keeping an eye open for any indications that there might be problems with your brakes is not only good for your safety, but it’s also good for your hip pocket! So if you want to avoid costly brake repairs on your vehicle, here are three signs that you need to recognise and have checked by your mechanic. Spongy brakes: When your brakes feel spongy or you need a lot more pressure to engage your brakes than normal, the hydraulic brake fluid could be leaking. This is a big safety problem, because without the pressurised hydraulic fluid, your brakes won’t work. Don’t waste any time thinking about it, just book your car in with your local mechanic ASAP. For quality brake repairs by experienced mechanics in Browns Plains, call Steve Sorensen Mechanical on 07 3809 2711 or send us an email. As an automobile mechanic shop in Browns Plains, we frequently service and repair both 4WD and AWD vehicles, but do you know the difference between these two types of vehicles? Many people think that these terms are interchangeable and simply describe the same type of vehicle, but they would be wrong. A 4WD (four wheel drive) vehicle is designed for off-road driving, because it can engage all four wheels to provide the extra traction needed to safely navigate difficult terrain. Corrugated dirt roads, gullies, low rivers, sand dunes and beaches can all be overcome with a good 4WD vehicle. Add in tyres designed for rough terrain, a bull-bar, lifters and all the necessary odds and ends so loved by 4WD enthusiasts and you have the makings of an awesome trip out bush. These vehicles don’t operate in 4WD all the time, you have to select this option, but when you do the power is divided between the front and rear axles. However, this can cause your wheels to spin, so to avoid this problem the power isn’t evenly spread between the inside and outside wheels resulting in a maximum turning ability without spinning your wheels. Why not bring your 4WD into our automobile mechanic shop for its next service or repairs? An AWD (all wheel drive) vehicle has a slip differential that lets it drive all four wheels at the same time with a rotational difference between the front and rear axles. So it’s similar to a 4WD, but it’s engaged all the time and is great for driving in wet slippery conditions where extra traction is necessary. It achieves this additional torque because AWDs are usually computer driven with sensors on each wheel that monitor both traction and speed, identifying which wheel needs more torque. If you are intending to go off-road then you really need a 4WD, as it’s tougher than an AWD and can handle the rough terrain easily. If you don’t want to go off-road then an AWD will give you maximum traction all the time and since it’s engaged all the time, the AWD is also more fuel efficient than a 4WD. To book a service or repair job for your 4WD or AWD with an experienced automobile mechanic in Browns Plains, call us on 07 3809 2711 or send us an email today. If you own a car and are moving to Browns Plains (or anywhere in Queensland) from interstate, then your car needs a roadworthy certificate. Even if you have an equivalent certificate issued somewhere else in Australia, it doesn’t matter – you still need to book you car into an auto shop that is an approved inspection station and can issue these certificates. Steve Sorensen Mechanical is an approved inspection station for roadworthy certificates in Browns Plains, you just need to make a booking with us and leave your car for a few hours. You will also need a roadworthy if you sell your car privately. What’s involved in roadworthy certificates? Once you have made a booking and dropped your car off with us at our Browns Plains auto shop, we will issue a roadworthy certificate if it passes the Queensland Government’s minimum safety standards checklist. If your vehicle fails this inspection, we will document the problems that need to be fixed on the form and make these repairs for you (with your permission), then issue the completed certificate to you. If you prefer to have your vehicle repaired elsewhere, then that’s fine, but you won’t be issued a certificate until the repairs have been fixed. If you are moving from interstate, you must register your vehicle within 14 days in Queensland and to do that – you need a roadworthy certificate issued in Queensland (you can also apply for a partial refund of your inter-state registration). You will also need to take your car registration plates with you to a Transport and Motoring Customer Service Centre, along with your roadworthy certificate when you reregister your car in Queensland. If you are caught by the police driving an unregistered vehicle, you will be fined. So it’s not something you can ignore (you will also need to get a Queensland driving licence). At Steve Sorensen Mechanical in Browns Plains, we perform inspections and issue roadworthy certificates for anyone who is in this 14 day window, so just let us know when you make your booking. Call us on 07 3809 2711 or send us an email today. Brake and clutch repairs can be quite expensive, so wouldn’t it be great if you could predict whether your car may suffer from this type of problem in the future? Well, we might not have a crystal ball, but it’s fair to say that some cars suffer from particular problems more than other cars. If you are buying a second hand car or your car is about to run out of its warranty, it might be best to have it checked over, particularly if it’s on the list below. So let’s take a look at some of the more common car problems and the cars that tend to have these issues, more than others. Gearbox, brake and clutch repairs: The most common problems are with gearboxes and the Volkswagen Golf and BMW 3 Series tend to come out on top for the most issues with their gearboxes. For brake and clutch repairs on the other hand, the Volkswagen Passat, Land Rover Discovery and BMW 3 Series come out tops for problems with brakes, and the Ford Focus and Volkswagen Golf for clutch problems. As you can see, the Volkswagen Golf and the BMW 3 Series tick two of these boxes and a few others below as well, so it’s buyer beware! Electrical problems: The second biggest problems are concerned with the electrics of vehicles, an issue that might increase rapidly as cars become more high-tech and reliant on computers. The main culprits for electrical problems are the BMW 3 Series and Audi A3. Turbo issues: If you have a turbocharged car, then this is one of the last problems you want, so you need to be careful with the Ford Focus and BMW 3 Series. Alternator problems: There’s not many car owners who haven’t had to replace an alternator, but owners of the Land Rover Discovery or the Ford Focus might be more familiar with this issue than most. A/C issues: Most of us couldn’t function properly without A/C in our car, but problems with A/C condensers happen more frequently with the Volkswagen Golf and the Audi A4, than most other vehicles. For all repairs, including brake and clutch repairs, call Steve Sorensen Mechanical on 07 3809 2711 or send us an email. With all the increases in auto technology, you might think that they days of the automobile mechanic will soon be over! Well, maybe in 100 years’ time, vehicles will be self repairing, but for the time being, we still need mechanics to diagnose and repair our vehicles. It’s not a daft thought however, because if not for the grease on their overalls, often an automobile mechanic could easily be confused with a computer nerd, simply due to all the diagnostics they need to understand. Let’s have a look at some of the ways that technology might make the life of an automobile mechanic easier in the future or alternatively, more complex. Self-diagnosis: It’s been done with laptops and PCs, where the computer can self-diagnose itself, so why not in cars, van and trucks? If you want to understand more about how this technology could work in the future and how to program computers to self diagnose themselves, check out Raspberry Pi, a tiny programmable computer that sells for around $25 and is designed to help people learn how to program computers. Aluminium cars: Most vehicles, other than the really luxurious and expensive models, are made from steel, which is strong but very heavy. To make cars just as strong, but lighter on fuel, some manufacturers (Ford in particular) are considering changing to aluminium for their entire range. This means that an automobile mechanic who is experienced fixing steel body cars, will need the tools and the knowledge to fix aluminium cars as well. Wireless software updates: Sometimes your car’s software is updated during a regular service, but with the increase in technology, there’s the possibility that this can be performed on the fly. These software updates help to increase the car’s performance or correct operating problems and one of Tesla’s new electric cars takes advantage of this new technology. One of the issues with wireless updates, however, is that car owners won’t need to drive to their automobile mechanic as often for updates or performance issues, potentially resulting in lost sales. On the other hand, it’s unlikely that your local mechanic will be out of work any time soon! For high-tech diagnostics on all vehicle makes and models, call Steve Sorensen Mechanical on 07 3809 2711 or send us an email. None of us want to be faced with a raft of car problems, particularly when it means that we need brake & clutch repairs. Whilst these are not always very expensive to fix, they can be inconvenient, but the longer they are left, the greater the damage and the more costly the repairs. So it pays to catch any problems with your brakes or clutch as soon as possible, before the damage increases and ends up costing you far more than you anticipated. Here are a few common indicators that you will need brake & clutch repairs sooner rather than later. Clutch problems can start out simply as poor performance, but can rapidly degenerate into problems getting into gear, vibrations or stiffness when the clutch is depressed, or even grinding sounds when in neutral or when trying to get into gear. If your car starts slowly but the engine seems to be racing, this is called clutch slippage and occurs usually when the disc is worn, but can also be due to a broken motor mount and a number of other issues. If you have any of these problems, you will need to bring your car in for brake & clutch repairs and we will identify and fix the problem for you. If you brake light switches on, then it’s likely that you need brake & clutch repairs, but you will need to bring it in for us to identify the exact cause of the problem. Some signs that you might also notice is that your car veers to the side or vibrates when you brake, or you might hear a screeching or grinding noise. The most likely problem is going to be your brake pads or your rotors, both of which we can fix at our Browns Plains workshop. At Steve Sorensen Mechanical, we can identify and repair brakes, as well as manual and automatic clutches, so if you need brake & clutch repairs, don’t hesitate to give us a call on 07 3809 2711 or send us an email. We all know that rush hour traffic is a serious pain, but did you know that it’s also one of the biggest causes of brake and clutch repairs? The freeways in Brisbane seem to resemble carparks more than freeways in the morning and afternoon peak hours, so at first it seems unlikely that they can lead to an increase in brake repairs. The problem lies with all the stopping and starting that happens when you are crawling along the freeways. This constant on and off pressure on the brakes, not only leads to greater brake and clutch repairs, but it can also affect the life of your tyres as well. If you regularly commute to work in the busy periods, we recommend that you book a car brake service as soon as possible, just to be on the safe side. Problems with brake lines: The brake lines transfer the brake fluid to the brake pads, keeping them lubricated and operating correctly. That’s why we always check and refill your brake fluid during a car brake service. Constantly stopping and starting all of the time, which happens in peak hour traffic, causes these brake lines to wear away, which if it isn’t caught soon enough, results in leakage of your brake fluid. Your brakes then fail and you have an even bigger problem on your hands! Problems with drive shaft: Unnecessary or constant braking cause the ball in the socket of the drive shaft to move and if this keeps happening, it can lead to your drive shaft wearing down. The first signs of a problem are vibrations in the car and loud noises, such as scraping, rattling or clunking sounds coming from underneath the car. The drive shaft transfers the torque from the engine to the wheels, so any problems need to be addressed immediately. It’s a good idea to have a car brake service at the same time as an inspection of your drive shaft, particularly if you drive frequently in heavy, slow traffic. Problems with tyres: Whenever you press the brake pedal, the tyres still roll for a few metres (even if you slam on the brakes the car doesn’t stop on a dime). It’s this movement of the tyres after braking that causes excessive wear of the treads, costing you more money in replacements. For an inspection of your drive shaft, a car brake service or brake and clutch repairs, call us on 07 3809 2711 or send us an email. At Steve Sorensen Mechanical, we frequently perform brake repairs, auto brake services and manual car brake services on a wide range of vehicles for our customers. Your brakes are something you need to keep in good working order, because they are your last line of defence against a catastrophic accident. This means that you need to have your brakes inspected and serviced regularly. However, not many people really understand what we mean when we talk about rotor arms, pads and shoes. So here is a quick rundown on what we inspect during your car brake service, as well as when we perform brake repairs. What are the brake pads? Brake pads are found in disc brake systems, which is the most commonly used braking system in modern cars. Your car slows down when the brake pads press against the rotors, resulting in friction that reduces your car’s speed. The problem is that the brake pads wear down over time and eventually there won’t be enough friction to stop your car when you apply your brakes. Worn brake pads can be identified and replaced during your auto brake service or your manual car brake service. What are the brake shoes? Brake shoes are found in drum brake systems, often in older cars. They act in the same way as the brake pads, but they can be re-tooled and used again. You can still find replacement brake shoes on the market and they are often much cheaper than brake pads. The reason that brake pads are fitted to new cars, instead of brake shoes, is because the pads stay cooler under extreme use, while the shoes can get quite hot. When customers book in their older cars for brake repairs, they often want us to replace or re-tool their shoes. The rotors (also known as brake discs) are fitted to disc brake systems and match the brake pads. When you apply the brakes, the brake pads press down on the rotors to stop your vehicle. Over time these will also wear down and need to be replaced during your car brake service. There are different types of rotors for different uses, for example if you mostly use your car to commute to work then drilled rotors might be best, while for off-road work or towing a caravan you might need slotted and drilled rotors. For brake repairs, auto brake services and manual car brake services, call us on 07 3809 2711 or send us an email. When your new car is still in its warranty period, you need to keep up with its logbook servicing schedule or else you can void your warranty. This is important if something goes wrong with your car and you take it back to the dealer for repairs during the warranty period. They will check your car service log book and if you have missed any services, they might refuse to pay for the repairs. Luckily, you can take your car to any auto shop for the logbook car services, as long as they are qualified mechanics and adhere to the manufacturer’s specifications. So what are the benefits of taking your car to your local mechanic, rather than to the dealership for your car’s logbook servicing? Without a doubt, anyone who has taken their new car back to the dealer for their logbook car service has found that the costs are astronomical. No-one knows why the costs of a logbook service should be so much higher at a dealership, but its one of those immutable facts of life. When every dollar counts, its important to have your logbook servicing performed for a reasonable price, which is why your local auto shop makes sense. Their prices will be very competitive, as they need to keep their repeat customers happy, so you will always save money on your logbook car services if you shop locally. Your local auto shop is usually a small operation (often a family run business) where everyone is friendly and takes the time to explain everything to you in words you can understand. Customer service is high on their list of priorities, so they go out of their way to ensure that your experience is positive and that you are happy with your logbook servicing and any subsequent repairs. As an independent auto shop, the owner usually has many years’ experience servicing and repairing a huge range of vehicles, and their diagnostic skills can be second to none. Often, you find the most experienced mechanics are the ones that set themselves up in business and these are the mechanics you want working on your car. So why not grab your car service log book and make sure that you haven’t missed any of your scheduled services for your new car? Even better – book into Steve Sorensen Mechanical in Browns Plains and you will be guaranteed a first-class logbook car service. Steve Sorensen Mechanical has been providing Local Auto Repair to the Browns Plains region for over 20 years, with Steve working as a local mechanic for his entire career. Through these decades we have grown and seen the local area grow. We have built some great relationships with local businesses and people, with thousands of customer vehicles on our database for whom we happily carry out Logbook Servicing and Local Auto Repair. We are proud to be part of this community and be the modern workshop that most choose for Local Auto Repair. Due to our time in the area, we are now lucky enough to see new generations of customers coming through. It is a pleasure to carry out Logbook Servicing for a customer and then have their grandchildren come in for a Logbook Car Service the same week. On our end, we also have a new generation of technicians, with Steve’s sons Scott and Brendan having worked in the business for over a decade. This allows us the unique ability to be able to cater to the specific needs of each generation when carrying out a Logbook Car Service or Local Auto Repair – we are as comfortable repairing a 20-year-old vehicle as we are syncing your Bluetooth to a brand new vehicle. For any Local Auto Repair or Logbook Servicing, you can contact us by email or phone 3809 2711, and we will be happy to provide an estimate or arrange a booking time. If you are searching for the right place to carry out a Browns Plains Vehicle service, you have come to the right workshop. At Steve Sorensen Mechanical we strive to provide you an above dealer level of Browns Plains Car Service, at a below dealer level price. Major Car services – when is it scheduled? When carrying out a Browns Plains Minor Car Service our qualified technicians inspect the entire vehicle, reporting any future signs of problems to you before they become larger more expensive repairs or cause you to break down. By completing a Browns Plains Vehicle service regularly, you are protecting the investment of your vehicle and will have the best chance possible of preventing any future costly repairs. With our decades of combined knowledge, we know the common problems on various makes and models, meaning each Browns Plains Car Service is tailored to your specific vehicle. To book a Browns Plains Car Service, you can contact us by email or phone 3809 2711, and we will be happy to run through any queries specific to your vehicle. Recently, I had the pleasure of inviting some fellow TAT subscribers into my workshop for a ‘playday’ and the topic of battery registration came up. For over 15 years now, European marques have strictly instructed the process to be carried out via a suitable scan tool at every battery replacement. With the procedure becoming common place in even the cheapest of modern econo-boxes, I thought it was high time to get to the bottom of what the process does, and the hotly debated question – is it necessary? Improving on the regular old flooded cell batteries, which required regular water top up, advancements were initially made by replacing the average 6% antimony used to strengthen lead plates, with familiar sounding materials such as calcium or silver. These were first referred to as “maintenance free” batteries. With benefits like reduced outgassing, corrosion and self-discharge, these batteries prefer a higher charge rate than traditional, around 14.4 – 14.8V, to reach full capacity. The Achilles heel of calcium batteries is their intense dislike of deep cycle discharge, more so even than traditional flooded cells. Still in the lead acid battery family, a unit enjoying rapid growth due to the harsh environment of ‘Start-Stop’ equipped vehicles is the Absorbed Glass Mat (AGM) battery – also referred to as Valve-Regulated Lead Acid (VRLA), or a lead battery with a pressure relief valve. The earlier flooded type batteries are simply not robust enough for ‘Start-Stop’ and repeated cycling causes a sharp capacity fade after only two years of use. With AGM technology, the sulfuric acid is absorbed by a very fine fiberglass mat, making the battery spill-proof. Compared to flooded cell batteries, AGM has very low internal resistance, can charge 5 times faster, is capable to deliver high current on demand and offers a relatively long service life, even when deep cycled. Unfortunately, AGM batteries are sensitive to overcharging. A burst charge of 14.4V (and higher) is OK; however, the float charge should be reduced to around 13.5V (northern state temperatures may require lower). Regular charging systems for flooded lead-acid often have a fixed float voltage setting of 14.40V; a direct replacement with an AGM unit could overcharge the battery on long drives. AGM and other ‘sealed’ batteries (such as Gel) do not like heat and should be installed away from the engine compartment. Manufacturers recommend halting charge if the battery core reaches 49°C. High charge rates and high heat results in outgassing (overpowering the pressure relief valve) which will dry out and kill the battery. Although battery registration is utilised by many brands now, I will speak mainly of BMW, who have been doing it for well over a decade. 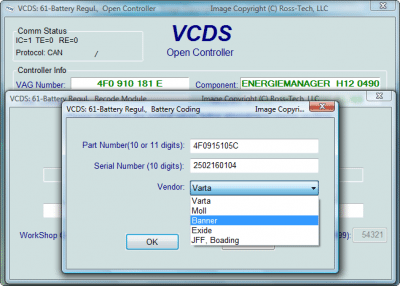 There are generally two service options, Battery Registration and Battery Programming/Coding. Current Odometer reading is stored along with readings of previous battery replacements. This registration function is advised when carrying out a professional battery installation, and certainly many vehicles will not clear cluster warning messages and low voltage/battery fault codes until it has been completed. I always recommend to carry out, and charge the customer for this process – however, in real world terms, my research suggests there is no evidence behind rumored alternator and electrical damage from not registering batteries. With the dynamic nature of the ‘smart charging’ systems, when fitting an identical new battery, the system is quite capable of adapting its strategy to the ‘mysterious’ new battery. Any charging adjustments based on age would be in millivolts, effecting long-term battery life negligibly. Indeed, once a weak battery has been detected, many systems will not retract error messages/not operate some systems until battery registration is completed. The second, and I believe most important, aspect of this topic is Battery Programming or Coding. If a different battery has been fitted, it is imperative that the car knows the specs of this new battery to modify its entire charging algorithm. 90Ah AGM, 90Ah, 80Ah AGM, 80Ah, 70Ah AGM, 70Ah, 55Ah, 46Ah. Suppose our high spec model came with, and is programmed for a 90Ah AGM battery, but the customer wants to save money by fitting a 55Ah lead/calcium battery. Aside from the real capacity issues, we know that the car is going to use an AGM based charging strategy which is terrible for a lead/calcium. On the flip side, perhaps a customer is doing less driving now and an upgrade to an AGM better suited to the down time is preferable. The charge strategy needs to know this to avoid overcharging. Both situations will result in drastically reduced battery life if not programmed in properly. Where makes like VW call for a specific code to be entered – if your physically correct aftermarket battery does not have a manufacturer recognised code printed on it, your best bet is to match up and enter a code with the same chemistry and specs as the battery you are installing – this is of course not ideal though. If a battery is staying with the same chemistry, but the Ah rating is changing, although I always recommend to reprogram the correct rating in, physically going up in Ah – ‘capacity’ – should be a non-issue. If the system wants to maintain the battery at about 80% State Of Charge (SOC), and then put energy in, the result will be that when it puts energy in, there is more capacity to put even more in. If a smaller battery was installed, the logic should still cut out based upon SOC, but the conditions may be such that it causes overcharge conditions or puts too much energy in too quick. The battery being installed must be the same chemistry that is programmed into the vehicle. Install a battery as close to the programmed Ah rating as possible – physically going up in capacity if forced. seconds before the voltage of the battery falls below 7.2 volts. Derived from discharging a fully charged battery at a constant amp draw without the voltage of the battery falling below 10.5 volts. A percentage estimate of how full the battery is. acid. Excessive deep cycling of a battery can cause a hardening of this deposit and make it impossible to return sulfate to the electrolyte. A sulfated battery is one which has these hardened deposits on the plates and cannot be recharged to full capacity. As one of the longest-running Auto Mechanic Shops in Browns Plains, we offer a wide range of Auto Mechanical Services. All of these Auto Mechanical Services are carried out to the highest standards, as can be expected when dealing with an Auto Mechanic Shop that has been in the industry for decades. Being a family business, we take pride in our Auto Mechanic Shop and want you to drive away feeling and knowing that you came to the right place for your Auto Mechanic Service. Trust our Auto Mechanic Shop to carry out all Auto Mechanic Service needed to keep your car in top condition. We are back for the new year and ready to take care of all your Vehicle Repairs And Servicing needs. Perhaps you need a Vehicle Inspection to get to the bottom of an odd noise or vehicle behavior you heard on your trip away? Rest assured that we are equipped to handle all of your required Vehicle Repairs and Maintenance. With new years being such a busy time of year, it is easy to let Vehicle Repairs and Servicing slip behind, while other tasks take centre stage. Start the year off right by getting that check engine light diagnosed or that alarming clunk taken care of with a Vehicle Inspection. Got a financial new years resolution? Keeping up to date with your Vehicle Repairs and Maintenance is the easiest way to avoid expensive repairs later on. By detecting a small leak from a coolant hose in a Vehicle Inspection, you can have it repaired for minimal cost, rather than having it unexpectedly fail completely, overheating the engine which can cost thousands. We understand that prevention is better than cure, so with absolutely all Vehicle Repairs And Servicing we carry out a thorough test drive, as we drive hundreds of different cars a week, with our finely tuned senses we may be able to detect and stop a problem in its tracks before it becomes major. Contact us today and we would be happy to discuss any of your Vehicle Repairs And Servicing, Vehicle Inspection, Vehicle Repairs And Maintenance requirements. CLICK TO VIEW THE ARTICLE HERE! fault codes and new ways to diagnose cooling systems. the ideal temperature environment for emissions and efficiency. quickly open the thermostat further. what the computer is thinking (pic 1). between effective cooling, energy efficiency and driver comfort. current increases to 814 milliamps (red) (pic 3). would be ideal, such as during engine shut-off after hard driving. and the ability to remotely mount the pump in unused space. luxury of a constantly spinning mechanical engine. tea because the future is hot. the surface of the sun! The poorly trained will quote a pair of slippers.